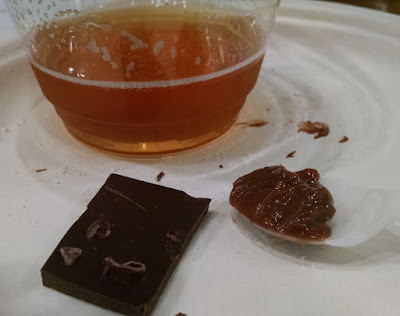 I'm not sure why there aren't more beer and chocolate pairings. I thought this was a brilliant idea! So thank you to Larder & Cupboard and Kakao for joining forces to make this happen!! 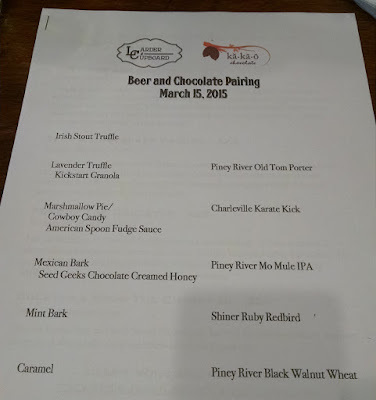 Here is the pairing list and you'll notice that the first piece of chocolate, Irish Stout Truffle, was all by itself since it was MADE with beer. Let's just say it melted in my mouth and I was already in heaven. 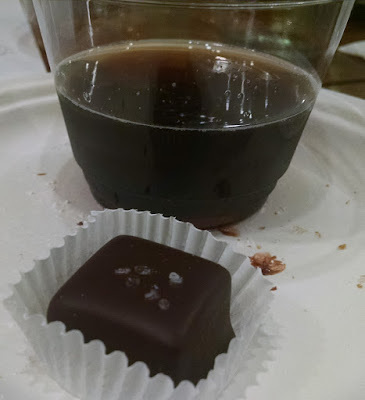 I didn't know how the other chocolate would be able to compete, but immediately after tasting the Lavender Truffle, I was blown away again. I had never had anything like that before and you could see the small slice of lavender carefully placed with tweezers by a dedicated employee. Just beautiful. 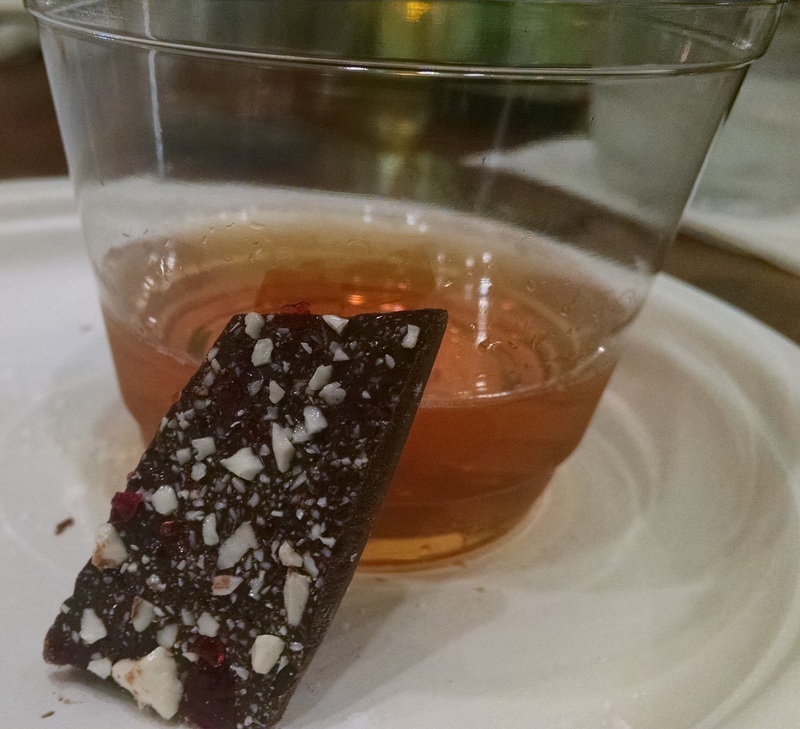 The Lavender Truffle, along with some Kickstart Granola (I always buy a canister to eat for breakfast), was paired with the Piney River Old Tom Porter. Thick liked you'd expect and I picked up a couple of these beers for Patience. Just when you think it can't get better, I had my first Marshmallow Pie...let's just say orgasmic if you are chocolate lover. It's like a S'more but without the graham cracker getting in the way. Just a mess of chocolate and marshmallow soft goodness. The Cowboy Candy (or pecan chipotle brittle) had a kick to it and the American Spoon Fudge Sauce was nice, but these were mostly ignored by me. All of these were paired with a Charleville Karate Kick. There really wasn't a kick per se as it was more of a light coffee stout. Seed Geek Chocolate Creamed Honey was paired as well and I could eat a whole jar of of it in one sitting. I used to spread it on my toast in the morning in place of peanut butter. Almost as good as Nutella! 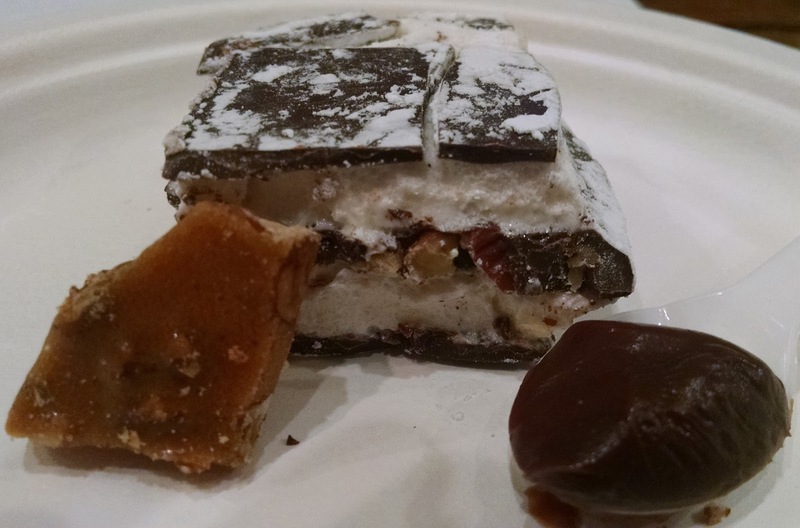 A Mint Bark followed and it's a top seller come Christmas time. 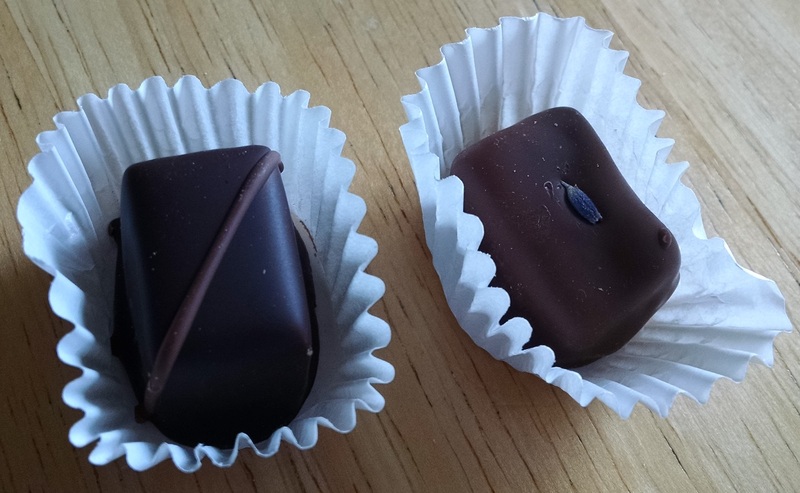 I loved the crunch factor of this chocolate! This was paired with a sweet and crisp Shiner Ruby Redbird. Last but not least is Kakao's best seller, the Caramel with sea salt, which was paired with the Piney River Black Walnut Wheat. Both items had a mild flavor as to not overpower the other. Very well balanced pairing. Everything you see in these pictures are for sale at Larder & Cupboard and obviously the chocolate can be purchased directly from Kakao. You better believe I purchased almost all of the chocolates to share with Patience.